Confusion has erupted in the Junior Chipolopolo camp after the players’ parents accused Football Association of Zambia – FAZ of abusing their children, the parents are demanding that their children be paid K3,000,000 for each game played but FAZ says there was no such an agreement. Drama started when the parents who have been sending text messages to FAZ president Andrew Kamanga united and took FAZ on at Heroes stadium yesterday insisting they want to have a meeting during which they aired their demands. The meeting became heated and it took some journalists like Chiko Mukoka to calm down the situation. 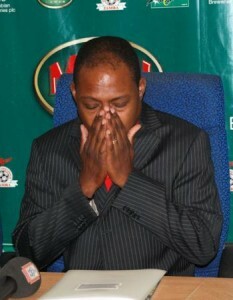 The parents complained that Zambia soccer fans leader Peter Makembo was being paid and benefitting from their children’s sweat but FAZ dared the parents and said that those who think their children are being abused must tell them to stay away at today’s CAF Under 20 final match between hosts Zambia and Senegal at Heroes stadium. And some FAZ insiders have accused former FAZ president Kalusha Bwalya of having influenced the parents to destabilise the Chipolopolo camp. Bwalya is also reportedly going round the country instigating a petition to have Kamamnga impeached at the forthcoming FAZ AGM. Meanwhile army and air force personnel have been deployed at Heroes stadium to beef up security at the Heroes stadium in the final match between Zambia and Senegal expected to kick off at 18:00 Zambian time. This follows the careless policeman’s discharge of teargas which chocked players and fans during the semi final match between Zambia and South Africa.